Summertime is winding down in Southern Maine. Before the cold months descend upon us, it's time to catch those warm rays and enjoy some rest, recreation and relaxation. Here are some great activities you can enjoy with friends, family (or even on your own!) to squeeze in a bit more of summer fun before we head into fall. The Sunset Folk Series at the Western Prom Park was really fun and relaxing activity to wind down a busy summer day. The Friends of the Eastern Promenade Concert Series has a few dates left. Bring a picnic, some lawn chairs, and maybe a blanket or two so you can lay out while you enjoy music from Rock My Soul or the roots reggae group Royal Hammer. It's a terrific way to enjoy the outdoors and listen to great music with family or a group of friends. You can't beat the price, either (free!). There are so many incredible trails to run, walk or explore at your own pace in Portland. They're all picturesque, well-maintained, and safe ways of taking in some of the best sights Portland has to offer. If you haven't explored them yet, what are you waiting for? Here are three to get you started. You can find even more suggestions at Healthy Maine Walks. Here's a fun day trip if you're looking for something more active and adventurous. 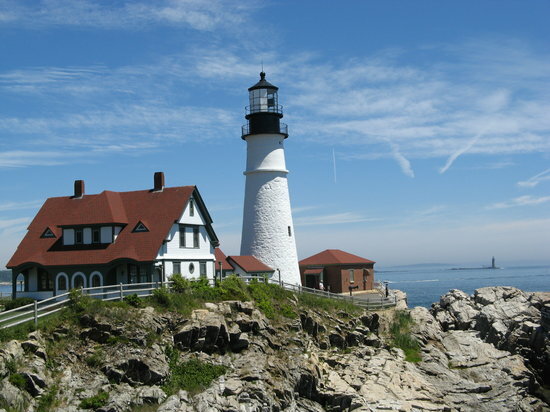 This particular tour lets you see five of Portland's historic lighthouses. It's a five hour bike trip, so it may not be for the faint of heart. If you love being active, this should be right up your alley! Besides getting a nice workout, you'll learn a lot about Portland's history and enjoy a gourmet picnic along the way. If lighthouses aren't your thing, check out a dozen other bike tours. You've heard of drive-in movies; now it's time to check out a walk-in movie theater! The rooftop of the Free St. Parking Garage in downtown Portland is a prime location for this summer series of totally free movie screenings. On Sunday, Septmeber 16th, you can enjoy a screening of The Royal Tenenbaums (2001). Here are more ideas on how to get the most out of your last weeks of summer. Older PostBreaking News: We're Moving!